Sometimes when running an SCCM task sequence, you want to prompt for input, for example to populate a Task Sequence variable that you will use later. In this example, I am encrypting a laptop HDD (SED) using Wave ERAS, and I’m using a command-line tool that populates the pre-boot authentication screen with the AD account of the laptop end-user. 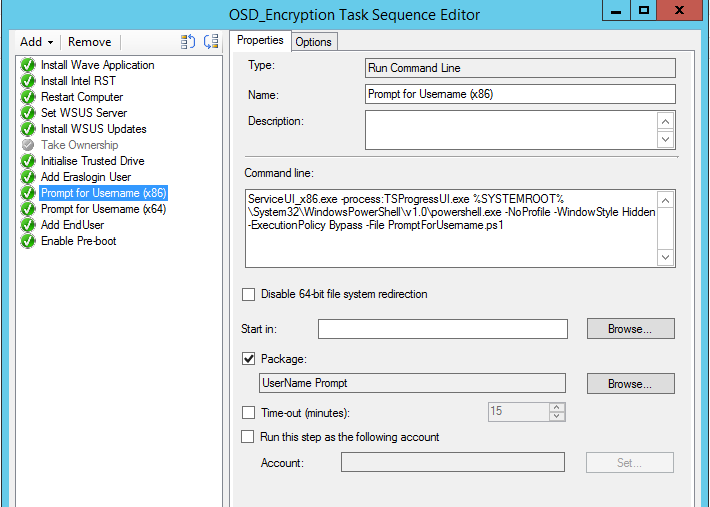 This runs during a post-deployment task sequence that provisions the encryption. As each laptop is prepared for a different end user, I needed to prompt for the user account during the task sequence, then pass the input to a script that adds the account to the encryption pre-boot. To accomplish this I decided to use a Powershell script with ServiceUI.exe to prompt for and set the TS variable, then pass this variable to the encryption script as a parameter. I tested it using SCCM 2012R2 integrated with MDT2013, but I can’t see why it wouldn’t work in older versions that support ServiceUI.exe. First, create a package in SCCM that contains the Powershell script below, and the ServiceUI.exe. ServiceUI.exe comes with MDT and allows you to break out of the TS session into the user session, where you can interact. Since I still deploy some x86 OS’s at times, I decided to include both the x86 and x64 version of the executable in the same package, and rename them accordingly, although the x86 version will probably work for both architectures. 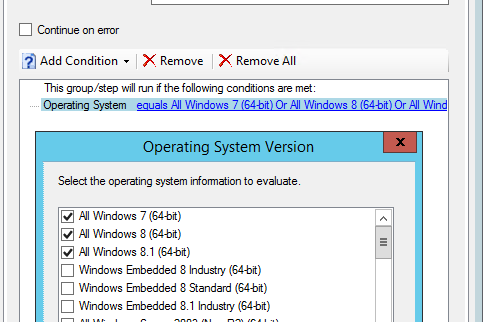 Then I use a TS condition to create separate steps for x86 and x64. This script prompts for input during a task sequence, and sets the input as a TS variable. Distribute your package to your DPs, no program is required for it. First, it hides the task sequence UI while the prompt is displayed, otherwise it will appear behind the UI. Second, we prompt for the input. Lastly we pass the input into a new TS variable called %TSUsername%. This example uses a non-deployment task sequence; it should also work during a deployment, although I didn’t test it yet 🙂 To work during the WinPE phase, you will need to add Powershell support to your boot image. For OS deployment there are more elegant ways of getting input during the WinPE Phase, such as Jason Sandys’ OSD++, or by using an HTA, but that may seem a bit much if just one or two inputs are required, so this is an excellent and easily implemented alternative that can be used during any task sequence. Great work here, Trevor. I’m looking at your work here and attempting to modify it to fit my needs for a similar request. We just need to prompt for input for a small string of text during the OSD and after the deployment has completed, write that file the the root of the drive. Yes I’m sure that entirely possible. Once you have the TS variable set, you can pass it to a step that runs a Powershell script for example, which will go ahead and query your AD, determine the computer name, and use it to set the OSDComputerName TS variable. First of all, congratulation for it’s good post! I’m looking for a think like that, I need a prompt to the user that is deploying the image that ask him to enter the OS image version and grab the value to the registry. Is that possible? thanks a lot for sharing and explaining this. I’ve used it to prompt for the old computername in an USMT task sequence. Can this be leveraged to prompt for all users logged in a system. I just tried this during a deployment and it works….for the most part. In your testing, did you have a yellow warning screen at the end of the wizard? Everything seems to have worked but I still see the yellow soft-warning screen.